Since 1982 Dave & Buster's is one of the country's leading upscale restaurant entertainment concepts in the United States and in Canada. Dave & Buster's now operates many, high-volume restaurant entertainment complexes throughout the US that offer a food and fun-filled experience for adults and families. Over fifty stores and a dozen categories of staff were overloading email communications and being very inefficient. WebOffice.com was approximately what was desired but it needed branding and customizing for Dave & Busters. We fast-tracked a design and placed it online for Dave & Buster's IT staff to experience and brainstorm feature tweaks. 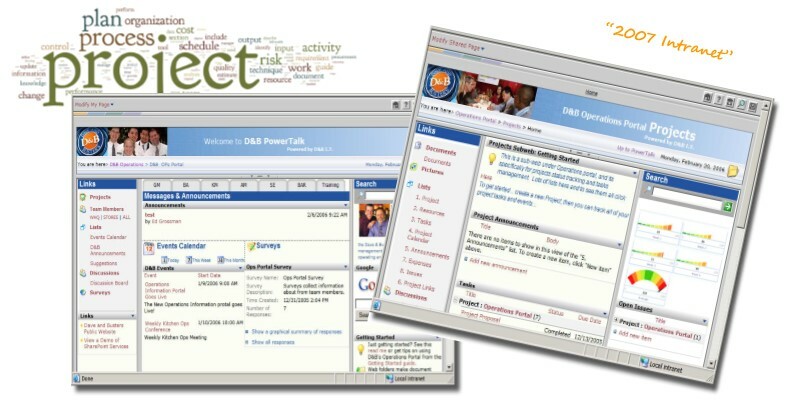 It was modeled after WebOffice.com and added the wide range of features from SharePoint. The D&B IT team shipped a DELL PowerEdge server to our office where we installed SharePoint, custom web parts, SQL reporting services, and virtual servers in a highly customized way based on our years of experience. We shipped the server back with a range of documentation and collateral materials aimed at easing the user rollout (tips sheets, PowerPoints, brochures). We then remotely provided training and support to ensure PowerTalk’s success. SharePoint forms a solid foundation for improving company-wide communications and migrating workflow solutions to a SharePoint environment.